PLEASE NOTE You will receive in this order: 2 Decals. One for each side of mailbox. Each decal measures 11″x 4″ in vinyl with with a Pierced Ear. 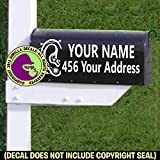 Add your custom Name and Address and color! 1 or 2 lines, your choice.